Epigenetic dysfunction is implicated in many neurological and psychiatric diseases, including Alzheimer’s disease and schizophrenia. Consequently, histone deacetylases (HDACs) are being aggressively pursued as therapeutic targets. However, a fundamental knowledge gap exists regarding the expression and distribution of HDACs in healthy individuals for comparison to disease states. Now, a study from researchers at Massachusetts General Hospital images, for the first time, epigenetic activity within the human brain. The team state that their findings suggest the ability to image the epigenetic machinery in the human brain can provide a way to begin understanding interactions between genes and the environment. The opensource study is published in the journal Science Translational Medicine. Previous studies show that modification of histones by the addition or removal of molecules called epigenetic factors can regulate whether or not an adjacent gene is expressed. HDACs are important regulators of gene transcription, and one group of HDACs has been linked to important brain disorders. Several established neuropsychiatric drugs are HDAC inhibitors, with others being currently studied as potential treatment for Alzheimer’s disease and Huntington’s disease. The current study uses Martinostat to quantify HDAC expression in the living human brain and provides the foundation for gaining unprecedented in vivo epigenetic information in health and disease. The current study develops a radiotracer, named Martinostat, patterned after known HDAC inhibitors in order to tightly bind to HDAC molecules in the brain. Results show that PET scans of the brains with Martinostat of eight healthy human volunteers revealed characteristic patterns of uptake, reflecting HDAC expression levels, which were consistent among all participants. Data findings show that HDAC expression was almost twice as high in gray matter as in white matter; and within gray matter structures, uptake was highest in the hippocampus and amygdala, whilst being lowest in the putamen and cerebellum. Experiments with brain tissues from humans and baboons confirmed Martinostat’s binding ability to HDACs, and studies with neural progenitor stem cells revealed specific genes regulated by this group of HDACs, many of which are known to be important in brain health and disease. The researchers explain that HDAC deregulation has been implicated in a growing number of brain diseases, so being able to study gene transcription regulation both in the normal brain and through the progression of disease should help the global medical community better understand disease processes. They go on to add that they’ve now started studies of patients with several neurologic or psychiatric disorders, and believe Martinostat will enable understanding re the different ways these conditions are manifested, to hopefully provide new therapies. The team surmise that their PET radiotracer, Martinostat, shows the expression levels of important epigenetics-regulating enzymes in the brains of healthy volunteers. For the future, the researchers state this could allow the global medical community to investigate why some people genetically predisposed to a disease are protected from it, and why events during early life or adolescence have such a lasting impact on brain health; or possibly resetting gene expression in the human brain. 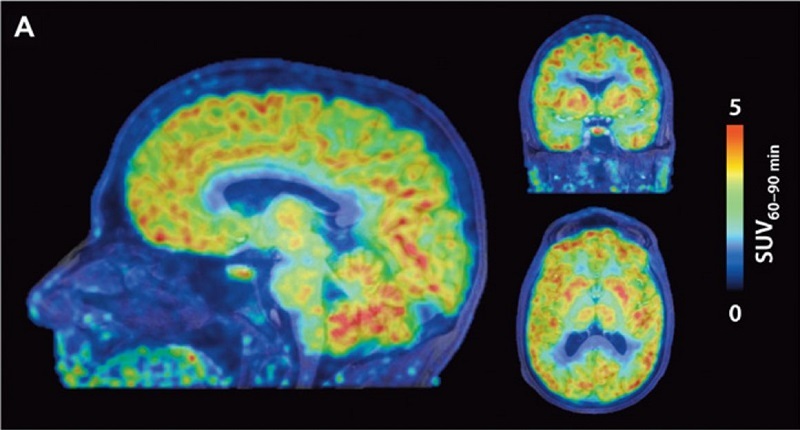 Martinostat imaging of the human brain reveals levels of the epigenetic enzymes called HDACs, with red reflecting the highest and blue the lowest levels. (H.-Y. Wey et al., Science Translational Medicine (2016) ).